Second Priest Professed In East Anglian Fraternity! Fr Frank Jackson ofs, a priest of the Brentwood Diocese, made his Profession to Willem Botha ofs, Minister of the Clacton ‘Our Lady of Light’ Fraternity during Mass held at Our Lady of Light & St Osyth Church, Clacton -on-Sea on Sunday 7th February. 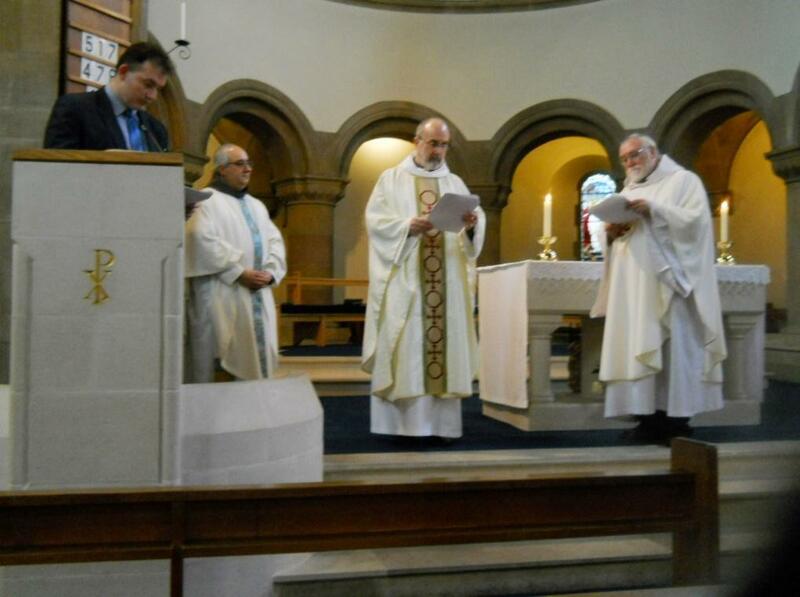 This was witnessed by Fr Jesmond Pawley OFM Conv, National Spiritual Assistant, who concelebrated the Mass with Canon Peter Connor, the Parish Priest, himself a Secular Franciscan, and Fr Frank, who is from the adjacent Parish of Sacred Heart and St Francis, Frinton-on-Sea. Left to right in the photograph are: Willem Botha ofs, Minister; Fr. Jesmond Pawley OFM Conv. ; Fr. Frank Jackson ofs; Canon Peter Connor ofs. What have we been up to at National? You heard about the National Seat from Andrea and I have to admit this has been taking quite a lot of energy. You will hear a lot more about this soon. Otherwise I have been occupied with the National Executive which met from Wednesday to Friday last week. We are already preparing for the National Council meeting which will be at the beginning of March. This is when the council will all see our new premises. We are having a weekend meeting and have managed to arrange accommodation – close by was too costly, so we are going to be staying about 3 miles away. This post is just a sketch, as many final decisions await national approval. First I want to say how welcome we were at Cold Ash. The sisters make us feel very much part of the same family. We had time to catch up with their news and work. The food was really good and plentiful. For anyone interested, it is possible to arrange to stay there as individuals or in small groups for a retreat time. All members attended the National Executive meeting, including our 3 national Spiritual Assistants. We all worked very hard. Every time I went into the conference room I found people working, often a couple of members helping one another or in dialogue about something. The new website will be a main item in March. Roger will give practical help and give more insight into the workings and what we need to know. As usual, we were delighted to hear from Christine Frendo on the rapid development of the young Franciscan group in Gibraltar. This local fraternity is in a unique situation as we know but, nonetheless, their commitment, prayer, formation, range of activities, generosity, celebration – in a nutshell, the spirit of fraternity – is inspirational and very encouraging. Anyone who has access to the National Fraternity Facebook will see how much they do. We asked Michael for a draft budget which he brought and we discussed in detail. This enabled us to see how things stand. We know that there is a three year cycle, given the nature of our Order, and it was helpful to see a plan emerging for this three year term. Debbie is another new member on the executive. She has decided to promote the new day of prayer for the environment which will be annually celebrated on September 1st. Debbie will be sending a novena and making suggestions about how we might become involved locally and/or regionally. Andrea has been doing a lot of good work in dialogue with Michael Hagger (who administered the old website) and did much other valuable work for our national fraternity. More on this after the national council – keep some time free to digest all these things I am promising you! For the present, Pam is visiting the national seat to deal with correspondence and stock. This seat address will come to be used more and it makes sense to keep stock there. It emerged that there are two consecutive weekend meetings on Mercy, marking the Jubilee year. As it happens they will both be in Wales. It is possible that another event will be held later in the year, perhaps in Manchester. For now, you can find details of these weekends on the website. We watched the new DVD “Finding St Francis” during the first evening. It is an interesting presentation of Francis’ life, telling the human story rather than the inner journey and spiritual growth of Francis. It led to a good discussion and some ideas about how we might prepare future audiences. By the way, we were all struck by the Anglicisation of Italian names. This came from the Anglican Franciscans and it is intriguing to discuss different emphases. Our Spiritual Assistants were able to give us their perspective on Ofsgb. They work very hard on our behalf and contributed a lot in the group that will help us reflect on the state of our national fraternity today. All of us appreciated having time to get to know one another, time to discuss and consider. It is not our intention to always have overnight meetings but this was a very positive experience. As Francis rejoiced when the brothers gathered for a chapter, we sensed that we are truly a fraternity and time well spent together can only be to the benefit of Ofsgb. Please pray for us as we continue preparing for the National Council in a very different setting. As you will realise, if you have read this far, we have much to do in a weekend. We only celebrated Candlemas a week ago and it is Ash Wednesday tomorrow. The Christmas season seemed only too short already this year. At least the lengthening days might begin to bring to an end our wet, miserable, and, for some, dreadful winter. We have had early daffodils, snow drops, crocuses and blossom. I was delighted when I was asked to give an introduction to Franciscan Spiritual Direction to a group of Anglicans training to be directors in the Rochester Diocese last Saturday. It felt like a breath of fresh air and a welcome break from all the business of work for ofsgb. It brought me back to Bonaventure’s Major Life, a key source for the Franciscan Spiritual Direction programme I studied and later taught. Then I read this poem. It reminded of the vestiges, traces, of God that Francis saw everywhere and Bonaventure builds into this carefully crafted – text. I decided to share it as we enter the Lenten season. His crown of thorns is twined with every thorn. Joseph Mary Plunkett 1887 – 1916. I am also looking forward to attending the weekend on Mercy to be given by Brother Francis Dor (Our international Ofm Cap Spiritual Assistant), the week before I too present a weekend on Mercy as part of the Pantasaph programme. As a region, South East is planning a regional pilgrimage to the Jubilee Door in Southwark Cathedral. This Jubilee Year will bring great blessings but my hope is that it changes hearts and has a lifelong impact. Enjoying Francis, taking seriously our Pope’s call to mercy, together seem to have strengthened my heart, mind and soul and helped me to cope better with the confusion, deep sorrow and real concern that our world situation leaves me feeling much of the time. I pray that Lent will be a time of renewal, refreshment and prayer for each of us.